Xanthomonas axonopodis pv. glycines causes bacterial pustule of soybean, which is a common disease in many soybean-growing areas of the world and is controlled by a single recessive gene (rxp gene) commonly found in many conventional glyphosate-sensitive soybean cultivars. Since glyphosate-tolerant cultivars are commonly planted today, there has been no information about whether these new cultivars have bacterial pustule resistance. The goal of this study was to screen glyphosate-tolerant soybean cultivars for resistance to X. axonopodis pv. glycines. Three experiments were completed to evaluate resistance. In experiment 1, 525 commercial glyphosate-tolerant cultivars from 2001 were inoculated with X. axonopodis pv. glycines strain UIUC-1. Following inoculation, many of the cultivars were resistant (developed no detectable pustule symptoms) although 152 (~29%) developed bacterial pustule. In experiment 2, the aggressiveness of three strains (UIUC-1, UIUC-2, and ATCC 17915) of X. axonopodis pv. glycines were compared on three bacterial pustule-susceptible, glyphosate-tolerant cultivars. One strain (UIUC-1) was less aggressive than the other two (UIUC-2 and ATCC 17915) on all three cultivars examined. In experiment 3, 45 cultivars from 2005 (all different from 2001) were inoculated with X. axonopodis pv. glycines ATCC 17915. A range of disease severities developed with five cultivars (11%) having disease severity ratings as high as or higher than those on a susceptible check cultivar. 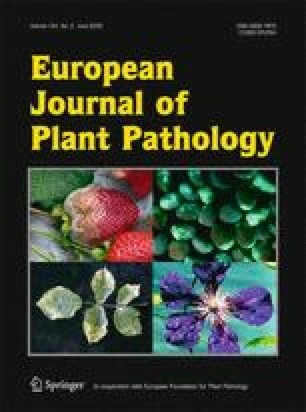 Overall, these results suggested that resistance to bacterial pustule occurs in glyphosate-tolerant soybean cultivars, but not at 100% frequency, which means bacterial pustule outbreaks could occur when a susceptible cultivar is planted and conditions are conducive for bacterial pustule development. A portion of this work was done during a sabbatical leave (S. L. Daniel) at the National Soybean Research Centre at the University of Illinois at Urbana-Champaign. We express our appreciation to Andrea Pabon, Curt Hill, Ron Warsaw, and Theresa Herman for their help on this project. Funding for this project was provided by the Illinois Soybean Association and the Tiffany Graduate Fund at Eastern Illinois University. Duke, S. O., & Cerdeira, A. L. (2007). Risks and benefits of glyphosate-resistant crops. ISB News Reports, January, 1–5. Retrieved August 24, 2008 from http://nbiap.biochem.vt.edu/. USDA (2007). National Agricultural Statistics Service (NASS), Agricultural Statistics Board, U.S. Department of Agriculture. Retrieved August 24, 2008 from http://www.usda.gov/nass/PUBS/TODAYRPT/acrg0607.pdf.